Long-term residents and tradespeople of King’s Lynn may still think of us as AJ Paints; this branch was the local paint supplier for years before joining the Brewers family. 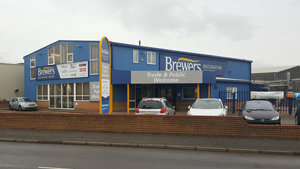 Now we’re a complete Brewers Decorator Centre – and so much more. Inside you’ll find not just a great selection of paints and decorating materials, but an excellent wallpaper, curtains and blinds show area and a kitchen showroom. You can also book a complete in-store kitchen design service. Of course our decorating knowledge is second to none, so you can always ask questions of the team or book a site visit for product recommendations based on first-hand viewing of your project. Our spacious showroom is on Oldmedow Road on Hardwick Industrial Estate, beside Pier Point Retail Park on Hardwick Road. There’s lots of customer parking directly outside, and we’re just a few minutes’ drive from the town centre and the major road routes of the A47, A10 and A149.